My name is Wyatt Ray Dawg, and I am the Majority. This post is sponsored by The Animal Farm Foundation and the BlogPaws Professional Pet Blogger Network. 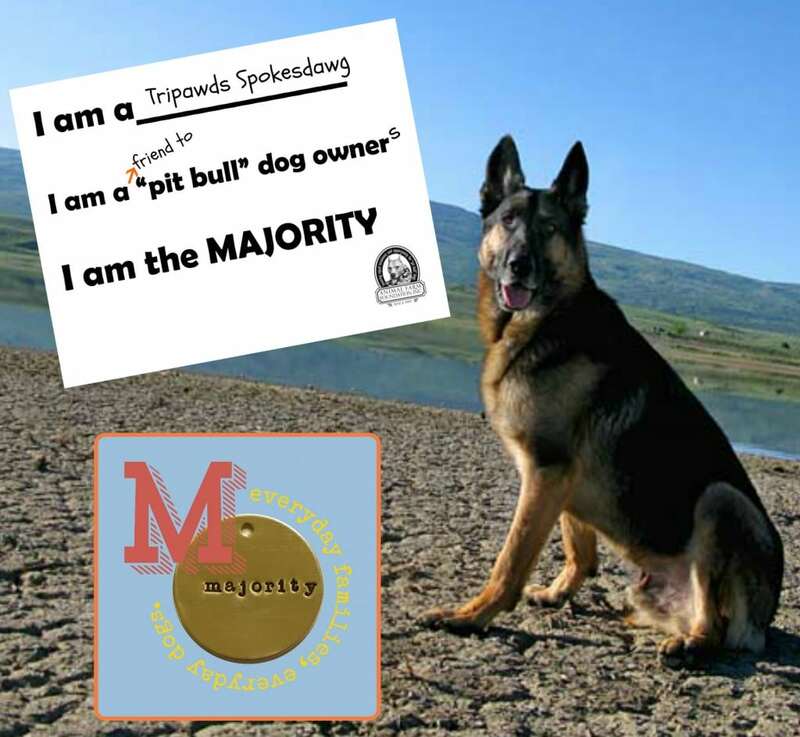 We are being compensated for helping spread the word about the The Majority Project, but Tripawds only shares information we feel is relevant to our readers. Animal Farm Foundation is not responsible for the content of this article. As Spokesdawg for the Tripawds Nation, I’ve had my share of the spotlight. Most times it’s good but sometimes it’s not, like when I go places with my people and we get turned away just because German Shepherd dogs like me aren’t welcome. It’s called “Breed Specific Legislation” and it bans dogs just because of their DNA, not because of their behavior. Isn’t that crazy? Even the ASPCA agrees with me. And it’s not just dawgs like me who get discriminated against, it’s my friends like gorgeous Gabrielle, a Tripawd Pit Bull rescue dog in Indiana who’s been in search of her forever home since last October. Can you believe that? Gabby is sweet, gentle and adorable but through no fault of her own she has a big problem when it comes to finding the perfect family. No, it’s not just that she’s missing a leg, but she also has to overcome all those negative stereotypes about Pit Bulls and their pawents. See, there’s this false belief out there that only criminals and reckless people want pit bull dogs. I think it’s these negative stereotypes that keep good people from even thinking about adopting pit bull dogs like Gabby. After all, who wants to be categorized as a bad person, right? But the fact is, the majority of pit bull dog pawrents take really good care of their dogs. They always make sure their dogs are safe and they work hard to bring out the naturally obedient, happy pittie pawsonality in every pooch. If we can spread the word about all those responsible pit bull dog pawrents, it will be much easier for my Tripawd pals like Gabby to get matched with good people. Today you can help do that, by joining The Majority Project. Whether a pit bull owns your heart or not, if you love all dogs please stand with celebrities like actor and “pit bull” dog owner, Jon Bernthal and show your support of The Majority Project, a real-life photo collection of responsible pit bull dog pawrents that’s working to obliterate all those negative stereotypes about pit bulls and the people who love them. Why does the Majority Project Need Us? Because who knows what breed will be stereotyped next! It could be Poodles – after all, any dog can bite! By participating and spreading the word among your friends and family, we can get the word out that each dog is an individual, just like their people. Remember, there’s strength in numbers and by giving pit bull pet pawrents the chance to show they are responsible, everyday people, we can build safe communities through non-discriminatory pet-ownership laws instead of trying to solve pet behavior problems by banning certain breeds. The Majority Project is a program of The Animal Farm Foundation, a non-profit group founded in the mid 1980s that exists to secure equal treatment and opportunity for “pit bull” dogs, eliminate Breed Specific Legislation, rescue and re-home animals and make grants to other humane organizations. Please join The Majority Project. 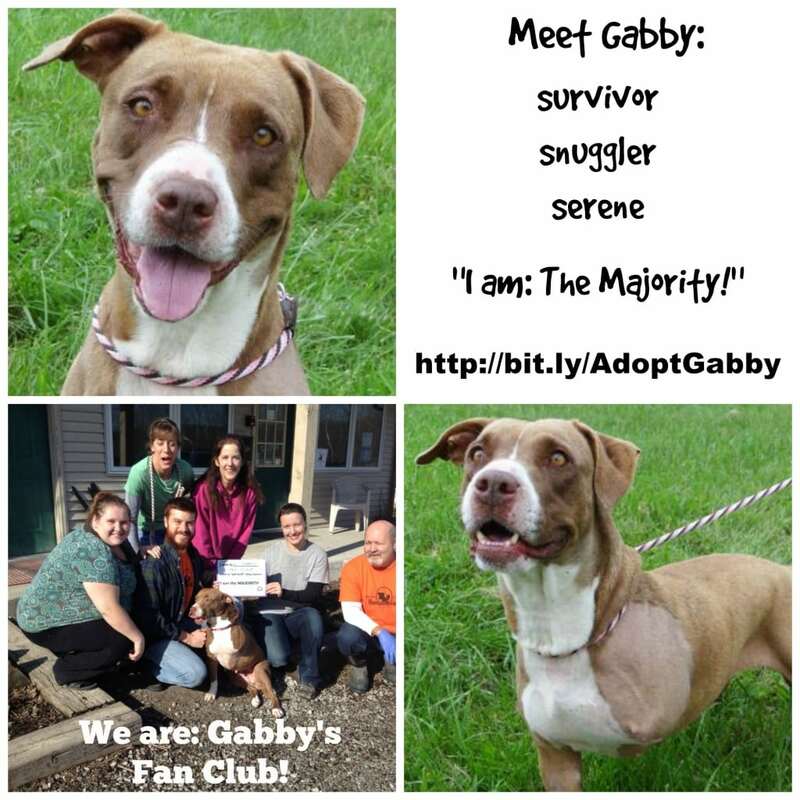 Help Gabby and dogs like her find great homes! Oh it looks like she was adopted! Hooray! Breed specific legislature is just wrong! I am so happy to see the I Am the Majority Project in action! I’ll be sharing Gabby and hoping she finds a forever home soon! Two things really caught my attention……did not know GSD Wyatt could get turned away from a location…or any dog for that matter…due to being a specific breed! !!! Grrrrr..
And the thought that ANY breed could be “targeted” next…yeah…that caught my attention too! Off subject…but did anyone see a news clip recently with a little gir (about five yrs maybe) being treated respectuflly as a pack leader for six or seven Pit Bulls? She had completel control as they sat and waited patiently for her to give them permisson to eat the food placed in front of them! And, when giving permission by her, they all ate side bynside with no issues!!!!! I’m thinking, this is GREAT!!!!! Nope….others saw it as parents being irresponsible, etc. Clearly they were trained to see her as their lack leader and she performed beautifully!! I suppose had it been a bunch of Chihuahuas they would have thought that was adorable…excelt they would have been fighting each other and grabbing food out of her hand! This is a GREAT PROJECT!! Kudos to them, to Cesar Milan, to ALL who are fighting so hard to stoo this out of control breed discrimination! !